During our lives we plan for many situations; education, having a family, vacations, weddings and especially our retirement. However, many neglect to plan their funeral as it is a realization of our own mortality. We purchase insurance to help us in situations that may happen, such as accidents, earthquakes, fire, floods and theft. We should also consider the pre-planning of our funeral service as it not only lets our survivors know what our wishes are, but it will also help our families through their time of bereavement resulting from your death. Saving your family the burden of having to make them under times of grief and stress. The assurance that your wishes are known and will be carried out as specified and obtain peace of mind. You have the opportunity to discuss options with our funeral professional and also with your family, church and friends. You can select the services and merchandise according to your wishes, spiritual beliefs as well as for your financial means, either by pre-paying for the services or having the monies set aside. Recording personal information that is required for Vital Statistics. This consists of full name, address, spouse's name, occupation, birth date, birthplace, parent's names and their birthplaces, Social Insurance Number, your next of kin or executor. Funeral or memorial service, burial, cremation, entombment or transfer to another city, music selections, participants (family and/or friends) to create a meaningful service. The selection of a casket or cremation container, an urn, a burial or urn vault, and a monument or memorial marker can all be discussed during a prearrangement conference. The services do not have to be prepaid, but the costs will be guaranteed not to increase if payment is made as a one time payment. 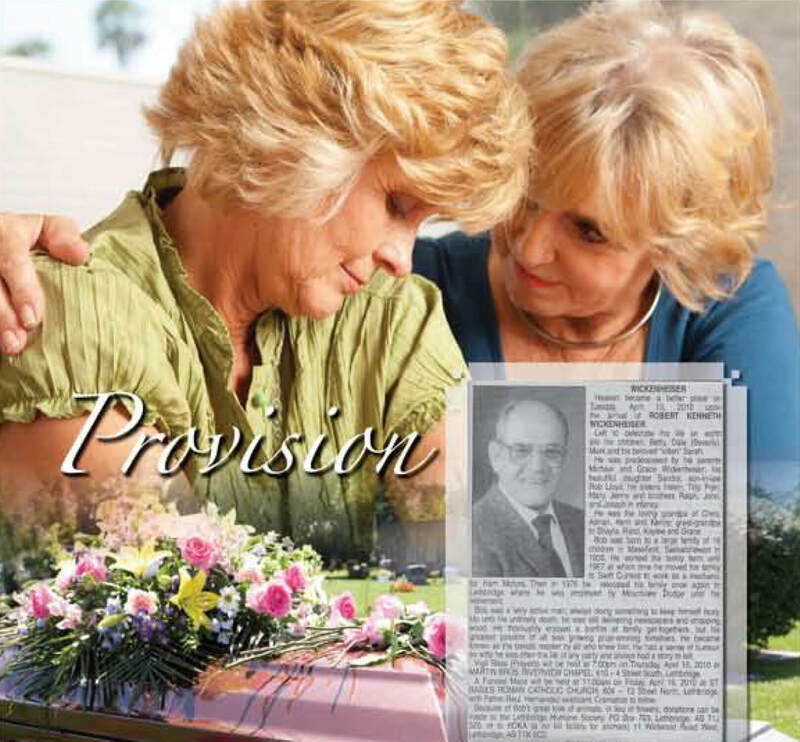 Payment for a prearranged funeral is placed into trust with the Bank of Nova Scotia and a G.I.C. is issued to the contract holder. The investment is a 5 year term. Why pre-arrange with Foothills Memorial Chapel ? At Foothills Memorial Chapel there is no membership fee or filing charges to record your wishes for your services. Our qualified staff, our central location, the facilities that are available and the variety of services that are offered. Feel at home or be at home. The arrangements can be made in our well appointed facilities or in the comfort of your own home.